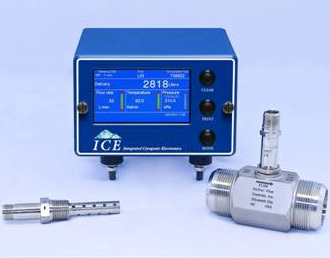 The “ICE” Integrated Cryogenic Electronics incorporates the newest technological advances in electronics and the time proven solutions in cryogenic flowmeter measurement. 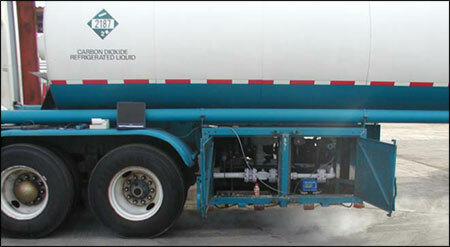 The ICE Cryogenic System is used to measure and record LIN, LOX, LAR, CO2 and other cryogenic liquids for truck deliveries and in-plant applications. The design is directed toward cryogenic service with ease of maintenance in mind. The ICE Cryogenic System is paired with a Hoffer turbine flowmeter which uses hybrid ceramic ball bearings to prolong the life of the flowmeter in fluids that offer poor natural lubricity. The system also includes a printer for delivery ticket printouts and an installation kit. Individual components may be purchased separately. Many features of the ICE unit including its user-friendly interface make it a great flow computer. It features a 4.3” full color LCD touch screen and easy-to-access panel-sealed push buttons and provides direct access to all measurement and configuration parameters. ICE’s rugged aluminum enclosure is equipped with shock mounts but can be fitted with an optional articulated bracket. The back panel is fitted with environmentally sealed, military style electrical connectors for all standard and optional I/O connections. The ICE supports measurement of “seven” predefined liquids (LIN, LOX, LAR, CO2 Single Pipe, CO2 Dual Pipe, LN2O, and LNG) and “seven” selectable languages. The Hoffer ICE system carries all applicable domestic and foreign approvals for all “requiring” countries including legal-for-trade approval in India from India Weights & Measures, MID approval for Europe and US NTEP approval. The ICE complies with Handbook 44 (NIST), MIL-STD 810B Shock and Vibration, NBS TN 361, ASHRAE Physical Properties of CO2, State of California Weights and Measures, and CE for Europe. 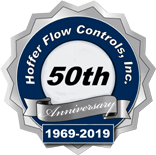 Hoffer is known for its exemplary service and calibration support. Hoffer “ICE” is the cryogenic flow computer of choice in the cryogenic industry for cryogenic tanker applications.